We publish below an article from December 2004 by Cuban journalist Celia Hart. This English-language version is based on the translation by W.T. Whitney Jr. published in Labor Standard (www.laborstandard.org/ ) We have revised and reworked it to some extent. Another version can be found on the following site: www.walterlippmann.com/ch-12-12-2004.html. We have retained some of Labor Standard’s explanatory notes and added other notes; all are in brackets. Caracas is once again the queen of the world’s left. The Congress of Intellectuals in Defense of Humanity [in December 2004] brought hundreds of the world’s foremost progressives together to greet December. The representatives of a thousand and one tendencies were on hand trying to come to some agreement on a decent future for the world. We needed them to see if we have pointed the compass in the right direction. I was there, full of expectations, mixed up with my chronic skepticism. So much rhetoric in summits, congresses, and world assemblies has chilled my faith in the usefulness of their methods. Maybe this time we will not be confined to the go-round of denouncing the world’s calamities, the violations of human and divine laws, and the contrariness of our enemies. What we need to do now is look for ways to wage our struggle and to determine what means we have to for offering a sharp answer to imperialism. generation of thinkers to be no more than a useless conglomeration of observers. political developments] remarked: "Social forums used to be positive, good for getting together, discussing, forming networks, and approving a declaration or two. But now they’ve become almost rituals, like a social gathering, where people rub elbows, invite some important personages, and carry out a march. And then everybody goes on home. I believe now they’ve lost the sharp edge of rebellion, of real criticism. A retrospective look suggests that they’ve not had much effect." I agree. And among many other things, there is a flag that appears to be missing at world conferences of the left. It is not much talked about because of fear, and is confined to narrow political parties. I mean socialism. parties and anyone with "isms." We will have to confine ourselves to prayers, descriptions, and proclamations. words might move our enemies on a summer morning, while they sip their orange juice. a Dantesque scenario of wars, lies, and poverty, we could even talk about a better world. evil," and other idiocies. And as if that weren’t enough, that same enemy wins the U.S. elections. I ask myself, what flag could ever mean more than that of socialism? Now that globalization has descended upon us all over the world, what could be better than to take up socialist ideas again, squeeze them, fiddle with them, mix them up, and then present the enemy with true international solidarity as an alternative to capitalist globalization. with all those who can add fuel to the fire—who sincerely aspire to a world that is not only better but qualitatively different. knives and forks, but is a cultural movement, and an all-encompassing, powerful world view." Any flag is welcome, as long as it is a real one: Bolivar’s, Hidalgo’s, those of San Martin and Jose Marti, and all of the rest, anywhere, flags that fill places of honor in our history. We have to follow, if only out of respect for them. inspiration of a socialist revolution. of coffee but Marti would have offered Marx some pointers about America, since Marti understood the events in Chicago much better. Marti certainly could have alerted Marx to the emergence of imperialism, having lived as he did in the belly of the beast. [Peruvian revolutionary leader] Jose Carlos Mariategui [1894-1930] sought a vision of socialism and class struggle that was adapted creatively and boldly to the present situation. Such a vision will enable us to see to it that Bolivar and so many of our predecessors did not plow the ocean [did not work in vain]. out the sword and pen, conquer and win people’s hearts, raising the only flags that can lead the march for a better world for us and for our children. The enemy is certainly in crisis. But if we if we do not take the measure of it quickly, we risk becoming caught up in it ourselves. become bitter pills for the revolution to swallow, more so even than the special period. Some Cubans are adopting a capitalist mentality. Without presuming to compare the Cuban policy to the New Economic Policy that Lenin had to impose on the young Soviet state, the reasons for it seem to be similar. But based on this measure, our variable takes a dip, just as was the case in the USSR. to build an impressive revolution inside the other. The education of social workers, young teachers, and paramedical personnel moved forward together with a little-known educational revolution by which the student-teacher ratio fell to 20:1 in a two-year period. everyone will be with the revolution. The ideological battle is part of the process too. debate, despite some tendencies toward repetitiveness and sloganeering. Overall, these changes do represent a decisive step-up in the SOC factor. to build up the SOC aspect of the socialist revolution. And to that end, it has to assure that forces are in place to counteract tendencies toward capitalist restoration. In order to survive, we voluntarily contacted that disease [of capitalist restoration] in 1994 with legalization of the dollar. Two forces are at war inside the revolution itself. the most revolutionary social strata. For example, the campaign against the mosquito that carries the yellow fever virus became a political campaign, because high school students played a leading role. Despite the relative worthlessness of our national currency, we have been avoiding layoffs. Sugar workers left without work receive salaries for studying. Despite our economic "poverty," Cuba boasts sports programs and indicators of health and education outcome more associated with developed nations. that would not fade, even with his accident and all. No longer would the green money "grate" on the hands of young Cubans. What about internationalism? Tens of thousands of our compatriots are working as doctors, teachers, or technicians in Latin American countries. International organizations, once they became involved in the tragedy that is Haiti, were astounded to learn that for every doctor there on the ground from developed countries, there were a hundred Cuban doctors. Besides their consciousness, these youngsters carry with them a piece of the Cuban revolution. anything extra. We are giving what we most want. In the same vein, while the Conference of Intellectuals and Artists was going on in Caracas, the Eighth Congress of the Union of Communist Youth (UJC) took place in Havana. The UJC has had a leadership role in the battle of ideas, along with Fidel, of course. On the last day of the conference, Fidel came out, wearing his traditional green uniform. From his remarks we could breathe in the concept of revolution put into practice. The battle of ideas has cost less than 2 percent of the national income over five years, but has produced hundreds of thousands of new comrades—an unprecedented revolutionary cost-effectiveness. exception of compañero Hugo Chavez. This shows even more that we are in a revolution. And we will not give it up, no matter how much it upsets the world. They have taken prisoners of war, our five comrades—internationalist fighters jailed in the United States for defending the revolution against imperialism and its Miami hirelings. We know that our socialist revolution is permanent, because those are U.S. prisons that are holding our political prisoners. building socialism. Socialism in one country? No, again no! Private property in China is going up, not down. I read that big capitalists head off to China out of choice. The country has become a giant export machine. invested and have plants there. into its economy. It looks to me that [in the case of China] the socialist market economy adds up to a lot more than just a temporary NEP [New Economic Policy, a partial restoration of market relations in the economy of the Soviet Union, which the Bolsheviks put into effect in 1922 as a temporary measure to restore production]. If the Chinese economy is so powerful, why do 58,000 workers go out on strike, only to be designated criminals? Why is it estimated that 23 percent of the Chinese workforce is affected by unemployment, why is privatization impacting the lives of 170 million people, and why are low productivity and population growth leading to downsizing of state-owned corporations? Why does the World Health Organization say that seven out of 10 of the world’s most polluted cities are found in the People’s Republic of China? Could it be that the means will become the end? Do social indices in China correspond at all to Chinese economic power? And if there is a repeat of the 1989 protests in Tiananmen Square, do we support the Chinese Communist Party just because it has a communist label? entrepreneurs to become party members. We have to grant China that it has become the model of efficiency in the capitalist world. I have no urge, however, to applaud that achievement. China is not experiencing socialist revolution. This is regardless of the fact that China is maintaining correct trade relations with developing nations (or undeveloped, as I should say). But they are still just trade relations. I trust that history will not be repeating itself in China. Karl Marx said that events happen first as tragedy (as we learned ourselves), and then, later on, as farce. Will Venezuela move toward socialism? My third example is Venezuela. Does Venezuela represent a victorious socialist revolution? We will know in a few years, as the process of revolution is consolidated. These are some of the questions: Has the Venezuelan government moved toward radical positions over time? Yes. Does the government deal with the evil effects of capitalist society by seeking out alternative solutions? Yes. Does the Bolivarian revolution gain stature as it contends with imperialism? Yes. Do "yes" answers make the Venezuelan revolution a socialist one? We still don’t know. More time has to go by, and many obstacles have to be overcome. Every one of us probably has our own yearnings, hopes, and doubts with respect to this question. What is important is that as time goes by, Venezuela is becoming more radical and less capitalist. dam since the miraculous 1960s. Chavez and his project are burdened with the bad taste left over from the death of "actually existing socialism." Empire. It is enough for Hugo Chavez to aspire to plow the ground left by the Liberator for that process to become radicalized. That is what happened in Cuba in the case of Jose Marti. To be Bolivarian and faithful to the implications of that cause, Chavez will not be able to jump over the teachings of Lenin, Trotsky, Che, and Fidel. It is not possible to leap from the 19th to the 21st century without running into this line of thought. Mission, and many more)—has acquired a special similarity to the revolution in my own country. The open struggles against landowners added an anti-bureaucracy element to the Oct. 31 electoral campaign. That boosted the SOC indicators that we defined earlier. So there is good news too. We are reckoning with two revolutions taking root and opening new hopes in Latin America. We need many more. Two tested revolutionaries are in charge of them. It is time now to go back to calling things by their right name. We shy away from radical vocabulary. The ones who call for the end of "isms" and "istas" leave it open as to whether or not they are including words like "socialism" or "socialist revolution" or "communist party" on their proscribed list. Chavez in his remarks at the Caracas meeting clearly said, "We feel a resurging force that every day, everywhere is growing, a human, moral, and political force. Things are happening in Argentina, Brazil, Spain, Libya, Moscow, and Iran. They speak Russian, Persian, Spanish, Portuguese, but it’s the same sparkle, the same force." President Chavez has declared that, in the face of these realities, "It is the duty of all the revolutionaries of the world to create a network of social and political organizations and weld together an international movement that moves onto the offensive." problem, and the solution transcends the borders of one country." And calling for an offensive to save humanity, he proposes, "to organize a network of theorists whose thinking rises to the level of a creative, transforming, and critical force to light the way toward a new world view for humanity." be honest, the word I am dreaming of is "the International." Facing global imperialism, that strong word is essential. contrast to Bush, who envisions the U.S. as a land of owners, Chavez is calling for the formation of a Latin American homeland, which will be a homeland for all the workers of the world. A homeland for today, to start working on today. Nuestra ["Our America"] of Jose Marti. I shiver when I think of the proverb that says, "The third try is the one that wins." Chavez said, "Out of this century comes our truth. We will have a homeland, and the homeland is our America— the Caribbean and Latin American. Now is the time to think and to do. The battle is today, not tomorrow. We have to seize the time, not waste it. We have been called upon to invent the homeland, make it free, and liberate it once and for all, for the sake of our peoples." example, of thinkers and fighters. Right off we have to appeal to the heritage of socialist thought. And as Armando Hart [Celia Hart’s father; a Cuban revolutionary leader who fought in the Sierra Maestra with Fidel in the 1950s] used to repeat almost endlessly, "We have a storehouse that we can turn to." inspire our "new president" [Chavez] in the final battle for the Americas. in Madrid], I am taking the liberty of reminding this tribunal of revolutionary thinkers about [Russian revolutionary] Leon Trotsky. Trotsky takes the prize in the “Guinness Book of Records” as the most defamed revolutionary in history. As far as that personage is concerned, many, even communists, inadvertently go along with the enemy. Trotsky has been accused of absolutely everything: being a fascist, an imperialist, an assassin, a sectarian, and putting the brakes on the revolution. The charitable ones maintain that Trotsky’s ideas are unnecessary, because they are obsolete. That is the last straw! But we are to blame for allowing what Trotsky represents to be confined to the so-called "Trotskyist parties," as if he were off the roster of revolutionaries, as if he were not the leading thinker who warned us from a Marxist point of view about the looming end of the USSR. More than anyone else, Trotsky analyzed the means by which a revolution and a Communist Party in power can be liquidated. The fall of "actually existing socialism" can neither be analyzed nor understood without reading Leon Trotsky. And that analysis is by no means old hat; it is right up to date. In his own flesh he experienced the excesses of a bureaucracy in power in a "socialist" state. one of the foremost revolutionaries, but the neglect of Trotsky has led to obvious deficiencies in our revolutionary practice. Internationalism, permanent revolution, and the impossibility of socialism in one country: these are key revolutionary considerations. As a Marxist, Trotsky has been accused of many things, but never of being a revisionist. If anything, he went the other way. Che and Fidel followed in his path, although they may not have known it. The slogan "create two, three, many Vietnams" epitomizes for Latin America the practice of both permanent revolution and internationalism. All communists, not just Trotskyists, must give Trotsky his due as a contributor to revolutionary thought. A reference to communism should, with the next breath, evoke the name Leon Trotsky. And Trotskyism is more than just one ramification of Marxism. Marxism as it was expounded and practiced in the Russian revolution and in the early days of the Communist International." [The quotation is from page one of James P. Cannon’s "History of American Trotskyism" (New York: Pioneer Publishers, 1944.) The text was originally delivered in the spring of 1942 as a series of lectures in New York City. It describes the difficult fight of maintaining a genuine Marxist working-class movement in the world’s richest capitalist country up through the 1938 founding of the Socialist Workers Party.] According to Montaner, "In his last days in Mexico, before he was murdered by Ramon Mercader, that son of a crazy Cuban, Trotsky was beginning to reject the idea of tyranny and discovering the value of economic and political freedom and the importance of formal democracy." Lenin’s side, and ultimately gave his best years and his life itself. 1940. And this kind of attack on Trotsky does irreparable harm to the ideas of socialism. Luckily, Hugo Chavez cheered us up by looking at the other side of the coin. In the closing session of the Caracas conference, he quoted words from a book by Trotsky he had bought in Madrid: "In ‘The Permanent Revolution,’ the Bolshevik revolutionary states that the problems of individual nations are not susceptible to national solutions, but involve all the peoples of the world." fact, all those roads lead to socialism. They have set up a permanent office in Caracas for anti-globalization. This might be the first office of the permanent revolution. 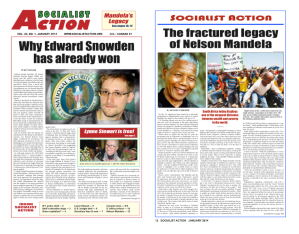 established an authentic socialist revolution. the Cuban people to go back "peacefully" to a corrupt so-called republic and to accept imperialism is impossible. would triumph in the U.S. before counterrevolution takes over in Cuba. As for myself and my "revisionism," I say this: I do not expect the corrupt, vicious formal democracy proposed by Montaner ever to be reinstalled in Cuba. But if it were, if the Cuban Revolution were to fail, if backward forces were to get an advantage over the revolutionary model in the battle of ideas, then my course is clear. communists everywhere will join are the currents of winds blowing anew in the Sierra Maestra. And I can assure Mr. Montaner that marching with me, besides Fidel, Che, Marx, and Lenin, at the head of our column will be the First Soldier, Leon Trotsky. With great pride I take my place in the ranks of Montaner’s "terrorists." "Capitalism has outlived itself as a world system. It has ceased to fulfill its essential mission, the increase of human power and human wealth. Humanity cannot stand still at the level which it has reached. Only a powerful increase in productive forces and a sound, planned, that is, socialist, organization of production and distribution can assure humanity—all humanity—of a decent standard of life and at the same time give it the precious feeling of freedom with respect to its own economy. labor. Second, he will no longer be dependent on the laws of the market, that is, on the blind and dark forces which have grown up behind his back. "He will build up his economy freely, that is, according to a plan, with compass in hand. This time it is a question of subjecting the anatomy of society to the X-ray through and through, of disclosing all its secrets and subjecting all its functions to the reason and the will of a collective humanity. In this sense, socialism must become a new step in the historical advance of mankind." April 4, 2005 in Cuba, Latin America.